Needless to say, this is a stout climb. It is definitely one of the hardest climbs in southern California. It is long enough that you can’t just power up it (unlike many of the Santa Monica climbs) and it gets progressively harder (just as your legs get tired and the elevation starts robbing you of oxygen). For more stats and an excellent elevation profile (broken down into lots of sections and with landmarks noted), check out SoCalVelo’s Mt. Baldy Road Page. The 2 miles following the tunnels will be your first test. Averaging 9.2%, these 2 grueling miles known as the Hogsback will make you wish you had easier gearing. Making it mentally tougher, this section doesn’t ever look steep. Why? You are following a canyon uphill. Since the whole canyon and the surrounding environment is tilted upwards, you don’t get any flat frame-of-reference to visually let you know that the road is steep. The only way you will be able to gauge the steepness is by noticing that you are having trouble staying upright because you are going so slow 😉 Oh, and in this section, the heat may kill you too in the warmer summer months. Also, the following 7.2 mile stretch from here to the ski lifts averages 8.1%. So yeah, Hogsback is awfully…fun. Right. What a backdrop for this village! And, 4,000 feet elevation! Give Devil’s Backbone a try if you like hiking. The scenery and views are spectacular. One of the most amazing hikes..anywhere. These last 4 miles to the ski lifts will give you almost 1900 feet in elevation gain – an average of 8.8%! 8.8% for 4 miles. Seriously. This is the part that really tests you. The fact that you have already climbed a few thousand feet and you are getting to elevations where there is less oxygen makes it all that much harder. Enjoy! At least the scenery is good! This is where the real punishment starts. The next 1.9 miles average about 10.0% grade (ouch!). Yes, 1,000 feet in elevation gain in less than 2 miles. This is the crazy switchback section of the climb. There are 8 distinct, tight and steep switchbacks in this section. This section is even hard to do in a car (see if you can drive this in a manual transmission car without shifting to 1st gear). On a bike, it is also rather hard! As tough as this section is, try to look up on occasion and enjoy the scenery. This last stretch is your final test. Averaging 14-15% for 3/10 of a mile, your legs will suffer. Yeah, the pavement is even worse than it looks. On the other hand, it is a nice and easy finish to this epic climb. There is a restaurant up there (the building you see in the picture above at the top of the lift) with an incredible view. I would highly recommend, on a nice summer day, driving up to the lifts, riding the lift to the notch, hiking up Devil’s Backbone to the top of Mt. Baldy (aka Mt. San Antonio), then getting a burger and beer at the restaurant at the notch. The view from the deck is really, really incredible. Note that, during summer, they are only open on weekends and holidays. The descent from the ski lifts to the village is very technical. The road surface is not great, the grade is very steep and the curves are tight. Sections of it are definitely fun, but keep in mind that you will build speed extremely quickly and some of that speed will have to be quickly scrubbed for the switchbacks. Also, watch for rock debris from some of the crumbling hillsides. With that said, this section of the descent is a great test of your descending skills. Once you hit the village, you are done with the technical section of the descent. The rest of your ride is a spectacular, fast descent. From the village all the way down to Claremont (over 7 miles), you will only hit the brakes a couple of times. That Hogsback section that was such a pain to climb? Easy 40+ mph on the descent (with the possibility of hitting 50mph if you pedal). The curves are gentle too, allowing you to sweep through them at that same 40+ mph. After Hogsback, you hit the tunnels. I’d recommend scrubbing some speed here since your visibility goes down in the tunnels. After the tunnels and the one slightly harder right-hand curve, hammer a bit and get your speed back up. While you may not carry 40mph for the rest of the descent, you will still get to ride at 30+ with sections above 40. Just watch for occasional rocks on the road – especially through the sections that cut through the hillside. With that said, this is an incredible descent overall. Very fast and very fun. A well earned reward after an epic climb. Make sure to click View Elevation on the maps above. The elevation profiles are rather impressive. Legends Burgers has the most amazing and satisfying chili cheese fries in my opinion – loaded with salty fries and topped with tons of chili and cheese. Yum! Their burgers are really good too. In summary, Mt. Baldy Road is one of the hardest climbs in southern California and is a must do for any serious cyclist. Give it a try. It is tough, but you will emerge a stronger rider having completed it. Thanks for putting this up. I’ve always headed to Baldy from GMR, then tried up from Claremont and got nasty flats twice… So probably won’t do that again. Lots of beer bottles smashed on the shoulder, etc. But it’s a great climb and glad to see your pics. Get some Michelin Krylions or something along those lines and try the climb again! Actually, thankfully, the shoulder was pretty clean this time. Looking at this post to get a feel for what the Tour of California stage will be like. Nice report. Doesn’t look like there’s much room at the summit for all the RVs, press, and finish line activities though… what do you think? Baldy’s parking lot is actually pretty good size…but small compared to most ski areas. It is basically a mom and pop ski area. So, the lot should have more than enough room for all the team vehicles and other official things. For spectators, I imagine the parking will go quickly. That said, the last mile or so could accommodate a fair amount of parking of the police and race organizers allow it. Also, the turnoff to Ice House Canyon (about 3-4 mile down from the ski area and about 1 mile above the village of Mt. Baldy) could provide for some more parking. With all that said, I think that Baldy should make for a great stage – this is an amazing set of roads with a truly tough and beautiful last 4 miles. Additionally, the stretch along Glendora Ridge Road will be very photo-worthy. I am really looking forward to it. This is one stage that I will absolutely not miss. Definitely think this one will rock ToC next year. Can’t wait to see the Schlecks shooting off from the front here. Glad you were able to ride Baldy. Such a great climb. No shame in walking that last wall to the parking lot with cramps setting in. Those last couple hundred meters are possibly the steepest of the whole climb. The concrete block section – are you talking about that one quick stream crossing (where there is rarely ever a stream) that transitions from asphalt to concrete and back? Just before the initial descent is slowed by a quick 20 foot climb? If so…yeah, that section is rough (especially descending). Bummer about the flat..but it sounds like you have an understanding girlfriend. Always helpful. ToC next year should be sweet. I can’t wait for the Baldy stage. I’m going to try my hardest to be there to see it in person. Epic stage. Yup, the stream crossing was the guilty one. It was too dark and cold that I cared to slow down and made me learn a lesson. Too bad I can’t be there at ToC as I’m heading back to Europe after three months in California (living in Norway). As it seems that you are serious about going for new, steep climbs, you should check out http://www.vikingtour.no if you ever consider going to northern Europe for a vacation in the summer. Great climbs, great views and a great social experience which I took part of with a couple of friends some years ago. It is a ride-at-your-own pace kinda race and you get the feeling of riding a real stage race for free. I know that stream crossing well. The one big bump in the road every time I drive up to Baldy for skiing! Thanks for the link to Viking Tour. I’d love to cycle in that area of the world some day. Or anywhere in Europe, for that matter. How do you like living in Norway? The pictures and videos I see of parts of Norway always blow me away. Going to ride this on Saturday. Can’t wait. ! Did you get a chance to ride this today? How’d you like it? Rode up to Baldy Village today starting in Glendora, along baseline, then up the direct route you outlined here. The tunnel section killed me. I was bonking hard and just envisioning food at the Lodge. Then got there and realized I didn’t have my wallet, just $2.50 stashed in a pocket. argh. I didn’t do the ski lifts yet, but will soon (trying to get ready for L’etape du California). Instead, headed back along GRR and GMR to make a full ~45 mile loop. Appreciate your photos and writeups on various climbs around here! Thanks for the excellent report of this route. It inspired me to do this in preparation for the L’etape du California. I actually did this route twice today, back-to-back. It was a tough training day, but I wanted to simulate the amount of climbing for the event, and now I think I’m ready for the du cali ride. Thank you for your help! 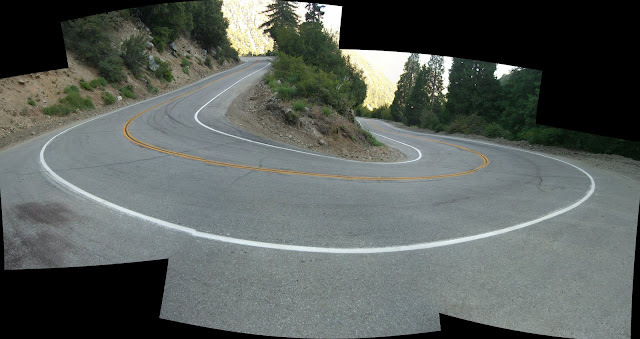 Also, I did the GMR to GRR to Baldy lifts to Mt Baldy road loop last week (inspired by your GMR report). Keep up the great work! Thanks! And sorry for the seriously long delay in responding. Hope L’Etape was a good ride for you. I ended up riding it as well – such great roads and fun to do with lots of other cyclists. That last climb to the ski lifts is always a killer. Thanks for posting this. It brings back fun memories from college over 20 years ago, when I learned how to ride a bike up a hill (key: don’t stop). Back then we didn’t have the GPS fun toys and easy access to GIS tools, so I studied the USGS topo maps and concluded that if you start down at about Bonita Ave in Claremont (e.g., on the Pomona College campus), then the ski lifts are almost exactly a vertical mile above (more than a mile of climbing, given the short sections of descent), in about 17 miles of road. Nice. I’m a fan of the not stopping technique. Also, looking at the topo maps is still great for checking out new climbs. It can still be a quick way to get a feel for a climb. Nice pictures on your flickr account, by the way. Hula, the climb to the notch is fun! Taking the fire road from manker flat is the best choice. You also get a paved start and get to see San Antonio falls. It is a fun short climb from the gate, the descent should be fine on cx tires, just make note on the way up of any sections that might cause issue. They do a nice job of maintaing the road. Thanks for the nice documentation of this epic climb. My buddy and I did this ride on 11/24/2013. 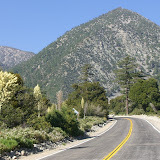 We went up from Glendora Mountain Road to Glendora Ridge Road and to the Village. After stopping at Buckhorn lodge for chips, cup-o-noodles and refill our bottles, we did the final climb to the lifts. It was tough, I had to stop several times after hitting the switch back to regain my breath. The final push to the end of the road was hard but inspirational. On our way down, we took the route as you documented here and went through the tunnels. It was fun but it was cold (41 F) going at 35-40 MPH. I think we picked a perfect day/time to do this because it wasn’t too hot or too cold. We started riding at 9 am and arrived at the lifts around 2 pm. I lost 7 lbs … what a hard way to loose weight :-). I much enjoyed your detailed measurements of the climb to the ski lifts! Also the photos and your comments were great to view/read. Yes, I have rode to the ski lifts on my bike on a few occasions; and have personal notes of the dates I have achieved the “up”ortunity to make it to the top. Thanks for your great post! My son and I rode up from Claremont to the ski lifts for the first time this morning. Your information about the route was really helpful. Glad I still had something left in the tank for the climb from Baldy Village to the lifts. The switchbacks were killer! I was curious about the road up to Mt. Baldy from Claremont since I had made the trip a few times with my parents over 60 years ago. Looking the route up I found your site. So glad. The pics brought back many memories. Went up in the spring when it was t-shirt and shorts weather in Pomona and when we got to the ski lift it started to snow totally unexpectedly. We froze on the lift but it was beautiful.